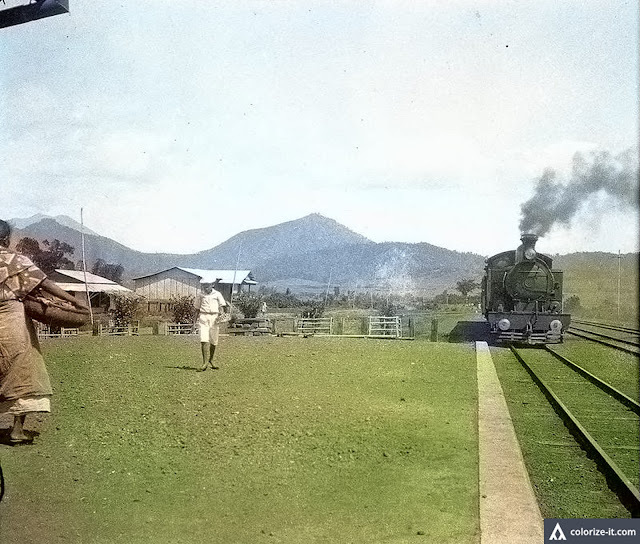 A railroad train in Batangas c. 1930. Image source: University of Wisconsin at Milwaukee Digital Library. Colorized courtesy of Algorithmia. The picture above was taken by the photographer Robert Larimore Pendleton somewhere in Batangas in the year 1930. Judging from the mountains in the distance, the train appears to have been in the vicinity of the northern Batangas Municipality of Santo Tomas. In the photographer's notes, it was stated that the picture was taken while soil surveys were being taken in the Mount Makiling area, so Santo Tomas is probably about right. There was, indeed, a train service that ran from Calamba all the way to the then-town of Batangas. The picture has been downloaded from the University of Wisconsin at Milwaukee Digital Library where it is made available for educational and non-commercial use. The picture has been enhanced using graphic editing software and colorized courtesy of Algorithmia. The rights to the picture belong to the Board of Regents of the University of Wisconsin System.